We’re excited to share updates on some of the major projects that will bring access to new community amenities and resources in your neighborhood. Please note, construction schedules are subject to change. To confirm the below and other work schedules, contact Shift at 844-SHIFT-SD. 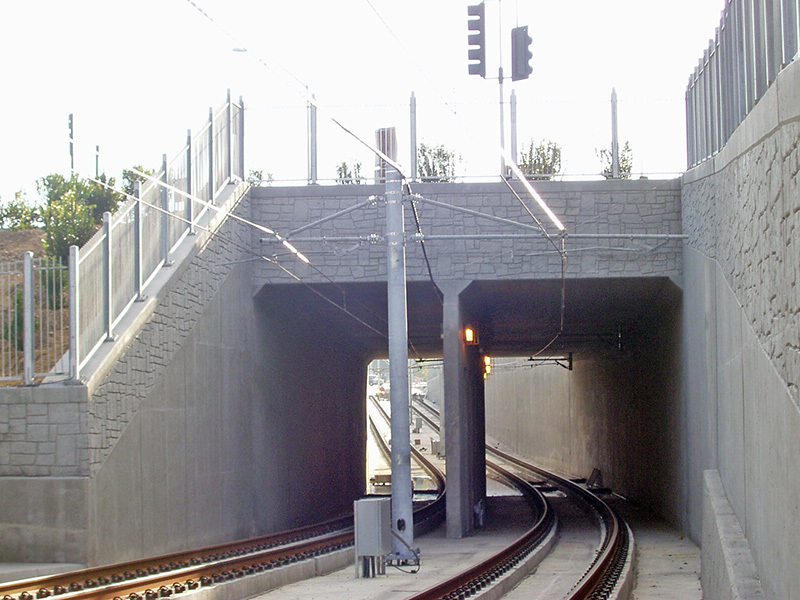 A method of construction for shallow tunnels where a trench is excavated and roofed over with an overhead support system strong enough to carry the load traveling above – in the case of the Mid-Coast Trolley, vehicle traffic. Sample photo from the Orange Line. Shift is excited to announce the completion of the I-5/Genesee Interchange project, celebrated at a ribbon-cutting on June 29.By providing links to transportation, employment centers, hospitals, and UC San Diego, the I-5/Genesee Interchange greatly improves movement through the area. Along with the replacement of the overcrossing, the project included widened freeway access ramps, an additional auxiliary lane in the northbound direction on I-5 between Genesee Avenue and Roselle Street, a pedestrian and bicycle bridge, and a new, separated and protected bike path linking the Sorrento Valley Coaster Station to UC San Diego. View of the completed pedestrian and bicycle bridge over Genesee Avenue. Column work along Genesee Avenue is expected to be completed in July 2018. For the next phase of work in this area, the construction team will install girders from August to October 2018. This construction will require closures of east and westbound traffic at six intersections, starting at Regents Road and moving south to Eastgate Mall, Executive Drive, La Jolla Village Drive, Esplanade Court, and the UTC Transit Center. Work has also begun on the station foundations, including the station at Executive Drive. Because construction schedules and road closures are subject to change, residents are encouraged to contact Shift for traffic plans and detours. For more information on the project, visit KeepSanDiegoMoving.com/MidCoast. Work to create the concrete columns seen along Genesee Avenue. Installation of the girders – the main horizontal supports – will require upcoming closures. The concrete pour for the Gilman Drive Bridge deck, the top surface of the bridge span, started in June 2018 and should conclude in August. 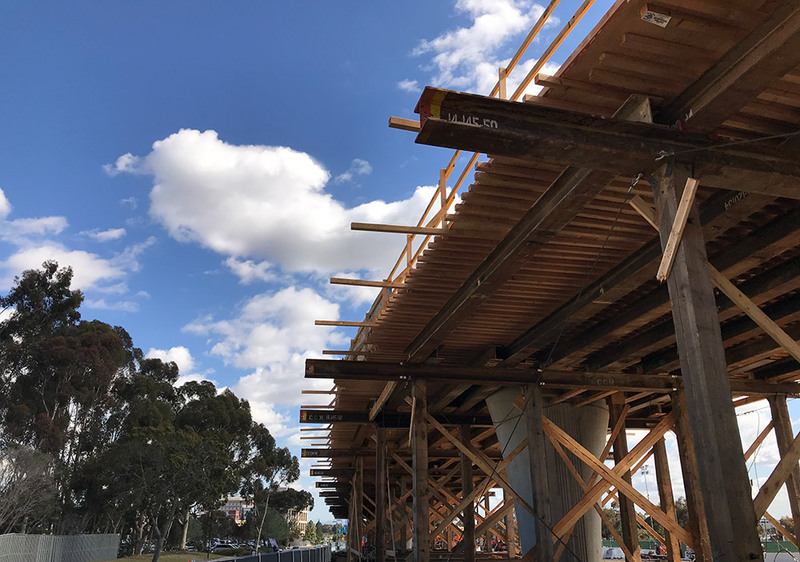 The removal of falsework is also expected in late August to early September. Visit KeepSanDiegoMoving.com to learn more about the Gilman Drive Bridge project and contact Shift for construction notices and upcoming closures. View of the Gilman Drive Bridge Deck prior to the final concrete pour. The North Torrey Pines Living and Learning Neighborhood groundbreaking ceremony officially introduced the start of project construction in June. As part of construction, campus parking lot P207 and P208 will are permanently closed to be demolished. Contractors are using the Torrey Pines Gilderport for parking during work hours from 7 a.m. to 3:30 p.m. Soil excavation is expected to occur in July; trucks will route from Muir College Drive to North Torrey Pines to Gilman Drive to I-5, and concrete trucks will be accessing the site from both the north and the south. Commuters should anticipate potential delays in these areas and can plan an alternative route by visiting the interactive construction map at ShiftSanDiego.com. 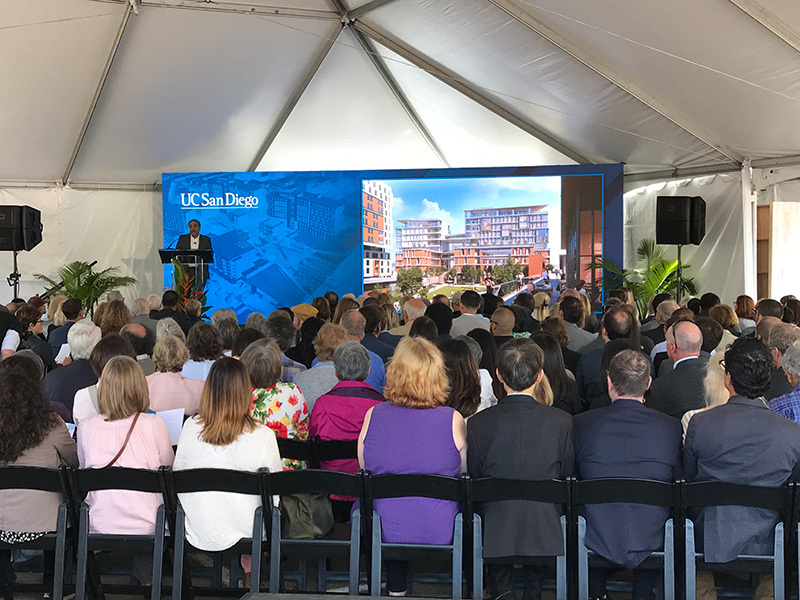 UC San Diego Chancellor Pradeep Khosla introduces the project at the groundbreaking ceremony. Let us know what projects you’re most interested in receiving information about via email at info@ShiftSanDiego.com or phone at 1-844-SHIFT-SD. Visit ShiftSanDiego.com to sign up for email alerts about major construction updates and access the map of all the ongoing projects. Improved east-west connectivity and access to and from Interstate 5. A new, separated and protected bike path linking the Sorrento Valley Coaster Station to UC San Diego, Scripps Memorial Hospital and Westfield UTC. 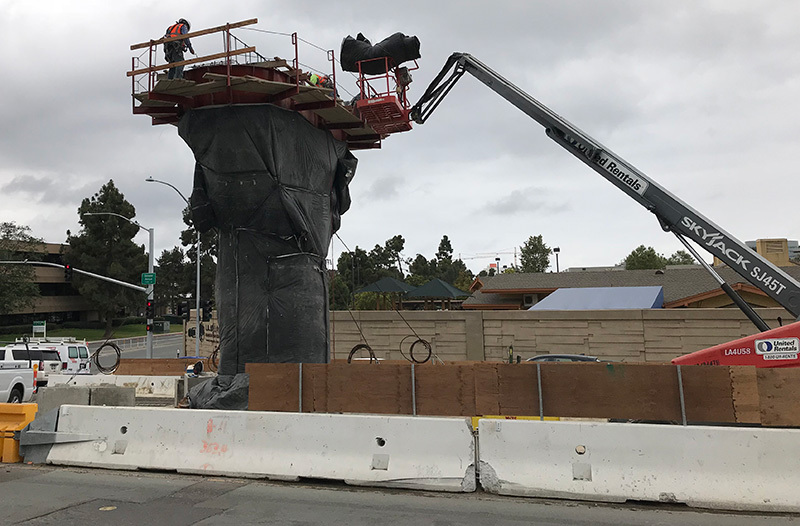 Drilling on Genesee Avenue is now complete, while column work for the section of the viaduct, the bridge structure that will carry the trolley, from La Jolla Village Drive to Regents Road on Genesee Avenue continues. Once completed, the construction team will bring in pre-cast tubs for further assembly of the viaduct. While this work takes place in the median, motorists are encouraged to follow signage indicating the appropriate speed in active construction zones. For more information visit KeepSanDiegoMoving.com/MidCoast. 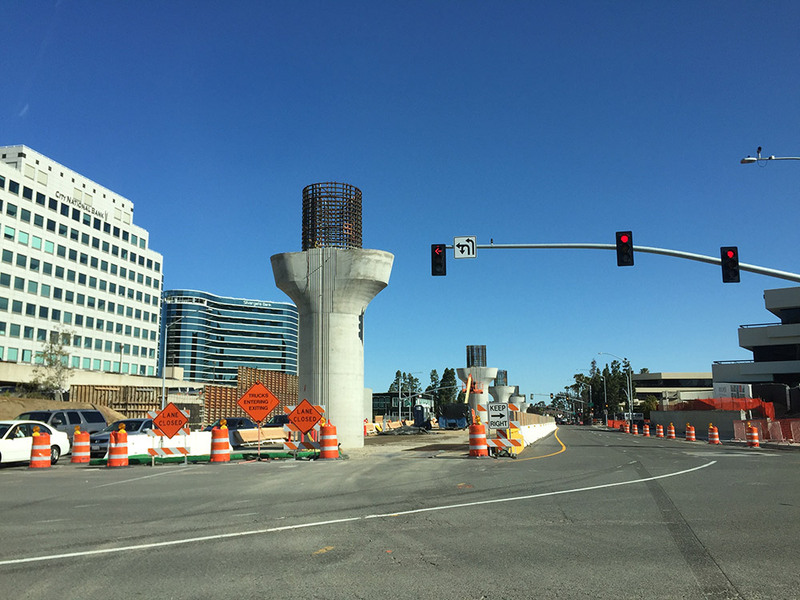 Construction to build the columns, now completed, for the Mid-Coast Trolley route along Genesee Avenue. 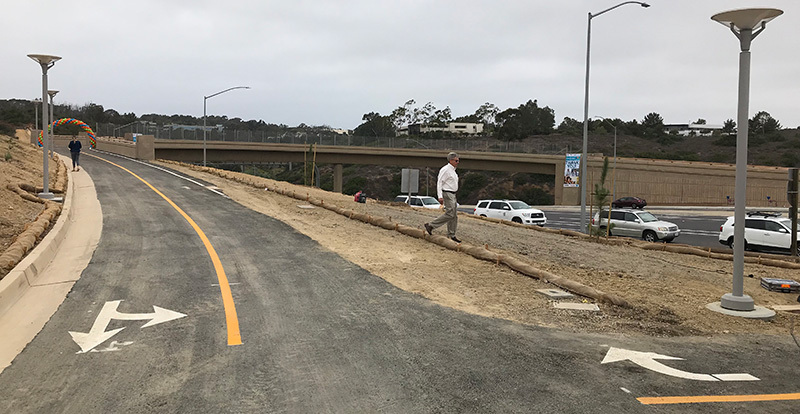 Construction activity is anticipated to begin on Gilman Drive south of the current work area from the southbound I-5 off-ramp to La Jolla Village Drive and La Jolla Shores Drive/Gilman Drive off-ramp. Work is excepted to start at the intersection of Gilman and Via Alicante and then continue north toward the current work zone. Continued impacts are expected for Gilman Drive, from La Jolla Village Drive to Via Alicante, until late summer 2018. The Living and Learning Neighborhood, located on the west campus between Muir College and Marshall College, just east of North Torrey Pines Road, will be a vibrant, mixed-use comunity. Construction is slated to begin this month, with new student housing expected to be move-in ready by Fall 2020. As part of construction, campus parking lot P207 and P208 will be permanently closed starting June 17, 2018. Access parking alternatives and shuttle service information at LivingLearning.UCSD.edu. The North Torrey Pines Living and Learning Neighborhood will be an exciting new addition to the UC San Diego campus. It represents a unique opportunity to plan, design and build a vibrant mixed-use community incorporating residential, academic and administrative space. Located on the west campus between Muir and Marshall Colleges, the Living and Learning Neighborhood will also feature dining and retail space as well as parking. With plentiful open space and a pedestrian and bike-friendly layout, the new neighborhood will be a welcoming space for all who are there to live, learn, work or visit. Read more about it on the campus newsletter This Week @ UC San Diego and view renderings on the NTPLLN website. To learn about other construction projects happening in the Golden Triangle and University area, visit the interactive map on Shift. Celgene, a scientific research company that is, “committed to improving the lives of patients worldwide,” has recently launched an advancement of their internal initiative to sustainability by becoming a participant of the iCommute Employer Program. Celgene already has a strong commitment to sustainability by implementing program efforts such as several educational and directional signage for recycling and disposing. Employees are also strongly recommended to take advantage of using the eWaste and battery recycle program the company provides. Celgene began integrating alternative commute choices as another sustainable component as they already have a group of employees that take advantage of the showers, lockers, and bike racks at the facility. The initial action steps after compiling Celgene’s commute survey results included hosting a Waze Carpool/iCommute tabling event and a free iCommute bike education tune-up at their Earth Day Fair and in tandem preparation for Bike to Work Day. The next commuter event that Celgene will participate in is the iCommute Carpool Incentive Pilot, which will provide each participant with 10 free Waze Carpool rides. With a baseline employee single-occupancy vehicle rate of 83%, Celgene is well on their way to reducing this and continuing to improve the lives of their employees. If your company would like to enhance or develop a commuter benefits program, contact the Shift San Diego team at info@shiftsandiego.com. Employees at Celgene`s Inaugural Earth Fair featuring teams from Shift San Diego, Waze Carpool, and iCommute`s employer bike tuneup serviced by Cycle Quest. Thursday, May 17 was Bike to Work Day, an event celebrating those who choose to travel sustainably by biking to work. With 100 pit stops scattered throughout the San Diego region, more than 10,950 riders stopped to get a free commemorative t-shift, refreshments, and words of encouragement. Several bike shops also set up bicycle repair stations to make sure everyone’s bikes were in top working order. Some had food trucks, live music, and one even had a helicopter for photo opportunities! Out of the 100 pit stops, nine were in the Golden Triangle. Employers hosting pit stops included Qualcomm, Illumina, Alexandria Real Estate, Scripps Health, and UC San Diego. Some were inspired by the Bike to Work Day festivities to try biking to work for the first time while others were seasoned riders who bike to work on a regular basis. For more resources to help you Go by BIKE or to find secure bike parking, visit iCommute. For suggestions on apps to help you track your ride, visit Shift. Obey traffic signals and stop signs. Ride with traffic, use the rightmost lane headed in the direction you are going. Make your intentions clear. Ride in a straight line, signal turns, and check behind you well before turning or changing lanes. Use a front white light, red rear light, and reflections when visibility is poor. Make eye contact. Watch out for turning vehicles and ride outside the door zone of parked cars. Look out for debris, potholes, and other road hazards. Check that your tires are sufficiently inflated, brakes are working, chain runs smoothly, and wear a helmet. Look twice for bikes before turning left or right onto a road. Check before opening your car door when parked on a street to avoid opening it onto a bike’s path. If the lane is too narrow, if there’s oncoming traffic, or if you don’t have enough visibility to pass…don’t. In fact, it`s the law. A driver passing a bike must have at least 3 feet clearance between any part of the vehicle and any part of the bike or the person riding it. You could startle the rider. Make eye contact and, if you make a mistake, everyone loves a courtesy wave. People on bikes have a rightful place on the road. Take a moment to realize that this person could be your family member, neighbor, or friend. There will be 100 pit stops across the San Diego region with a good number of them in the Golden Triangle and University City area. Make sure to register for Bike to Work Day to get a free shirt at any of the pit stops while supplies last. Have fun and grab a colleague or friend to ride into work. To be matched with potential carpool, it is necessary to include your commute time frames. By doing so, your co-workers can find you and you are added to the network of people at the organization. If you didn’t sign up with your work address, you can still add it to your profile by editing your profile and selecting add workplace. Carpoolers can get to know their prospective carpool partners by including a profile photo. This helps people verify who you are and builds a layer of credibility. The app facilitates connections between members of the same community, workplace or educational institution. As such, we hope riders take it upon themselves to get in the front seat with their neighbor, colleague and/or classmate. Be part of the movement to connect with the community like never before, reducing environmental impact, the cost of commuting and strain on global infrastructure. To download the app and begin carpooling, visit: https://www.icommutesd.com/carpool/carpool. Illumina has made great strides to encourage their employees to take alternative commutes to work and it shows in their company culture. Illumina received a Diamond Award last year for their efforts which included: monthly commuter prize drawings, hosting a Bike to Work Day pit stop, participating in Rideshare Week, an intranet commuter page, and offering a vanpool subsidy. “Illumina has been actively working with the Shift/iCommute team to encourage employees to take advantage of a portfolio of commuter benefits and resources. We want to provide a supportive culture for our employees to make sustainable commute choices that lead to cost savings on their commutes, improving their overall wellbeing and helping the environment,” Facilities Coordinator Kelsey Sanchez states. Meet some of their employees and find out which way they choose to get to work. Cheers to these every day heroes that help to ease and eradicate traffic by not driving alone to work and commuting alternatively. Blaire commutes to work in a carpool. Here’s Roger showing off the Compass Card he uses to commute by transit! Miriam shares a ride in a vanpool to get to work. Ludovic often chooses to “GO by BIKE” when commuting to work. Residing in University City, Jenn walks to work. James gets to enjoy the beautiful view of the coastline when he commutes to work via train. For more information on transportation solutions and how you can be a hero, click here. For employers who want to participate in the iCommute Employer Program, click here.